Stop No. 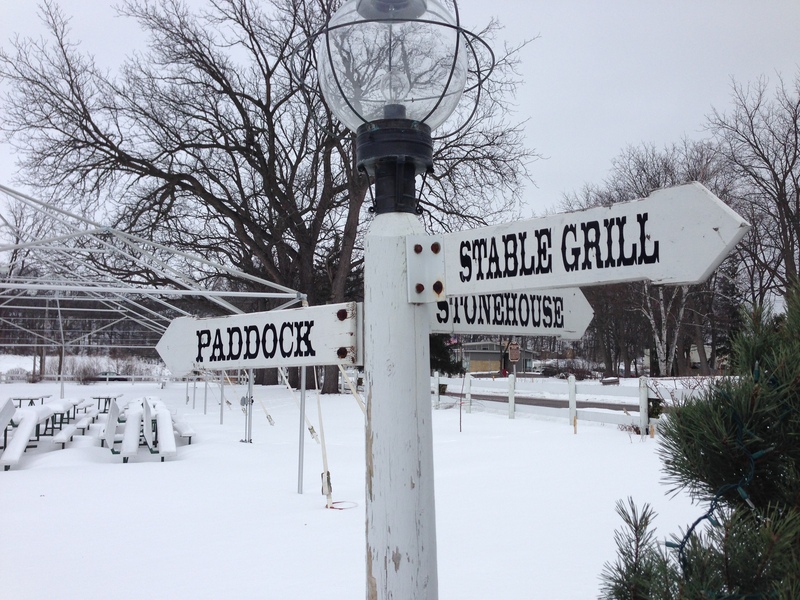 2 on my Winter 2014 Restaurant Week itinerary was Quivey’s Grove Stable Grill for lunch. 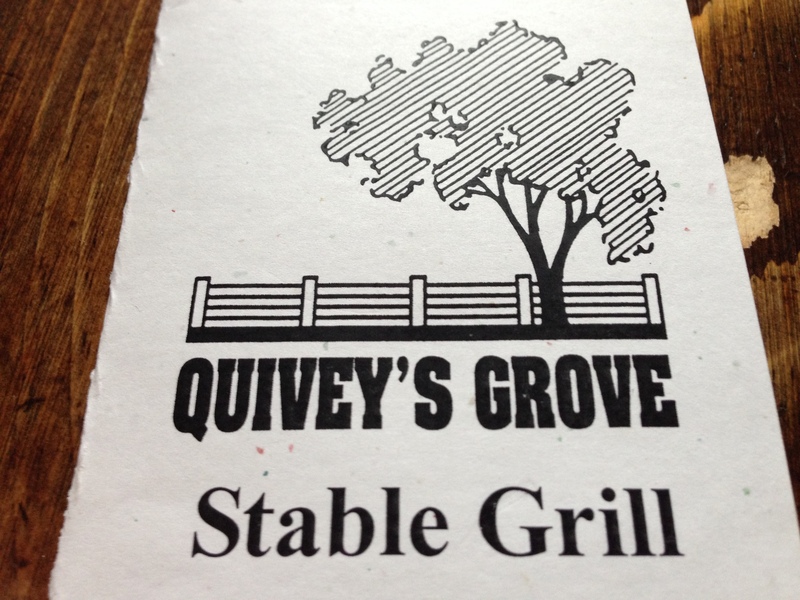 Quivey’s Grove has two stand-alone dining rooms – the Stable Grill and the fancier Stone House. The Stable Grill has a rustic bar and a dining room with winding and connected staircases going up to a couple different levels. It’s a very interesting building, and the extensive use of barn wood makes the whole place feel very welcoming and homey. Because of the crazy amount of steps I congratulate all waitstaff on their work! Our waitress was very nice, fast and efficient. Generally there are multiple things on restaurant week menus that I want to try so I usually suggest the person I go to dinner with and I split everything. At Quivey’s Grove my mom and I did just that! 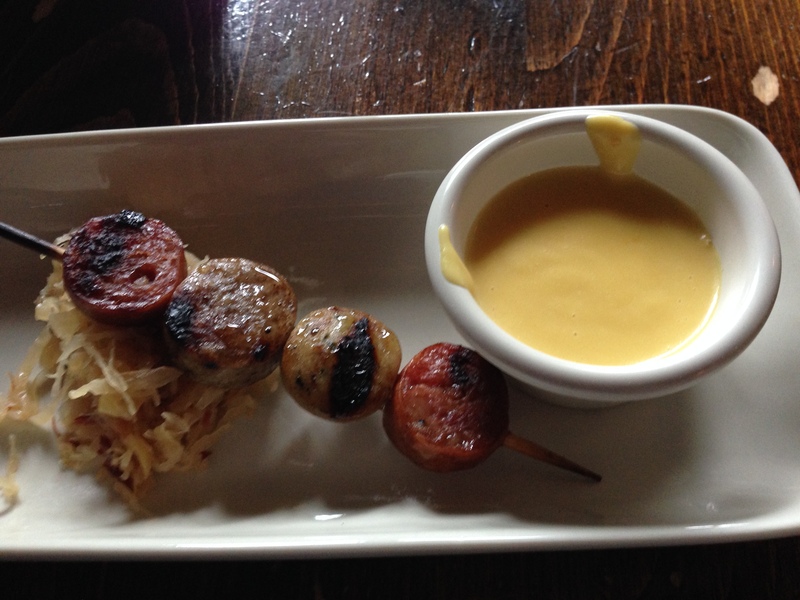 For appetizers we got the sausage sampler that had grilled Bavaria sausage, cherry kraut and cheddar sauce. I’m a big fan of Bavaria sausage and grilling it just made it better. The kraut was perfectly sweet and sour, and the cheddar sauce was so good I kept it for my french fries that came with my entree! 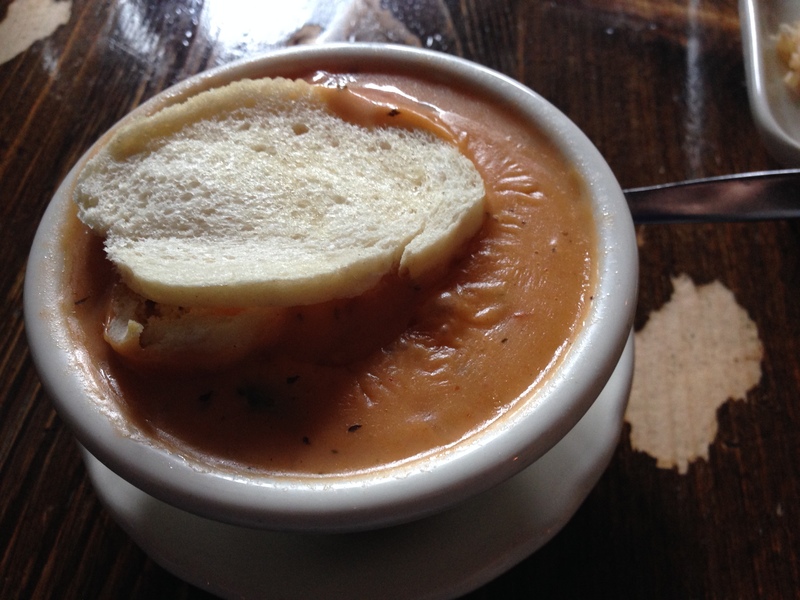 We also got the tomato bisque. The soup was good. I had chunks of tomato and carrots in it, but the flavor was nothing special. The thing that made the dish special was the grilled cheese crouton. When I read that on the menu I was expecting a couple small, crunchy pieces of bread with cheese on top. But instead what we got was an actual mini grilled cheese sandwich! It was two small pieces of crunchy baguette bread with a nice amount of cheese in the middle! A mini grilled cheese sandwich floating on top of tomato soup – what a cute idea! For entrees we got the cheeseburger and the fish fry. 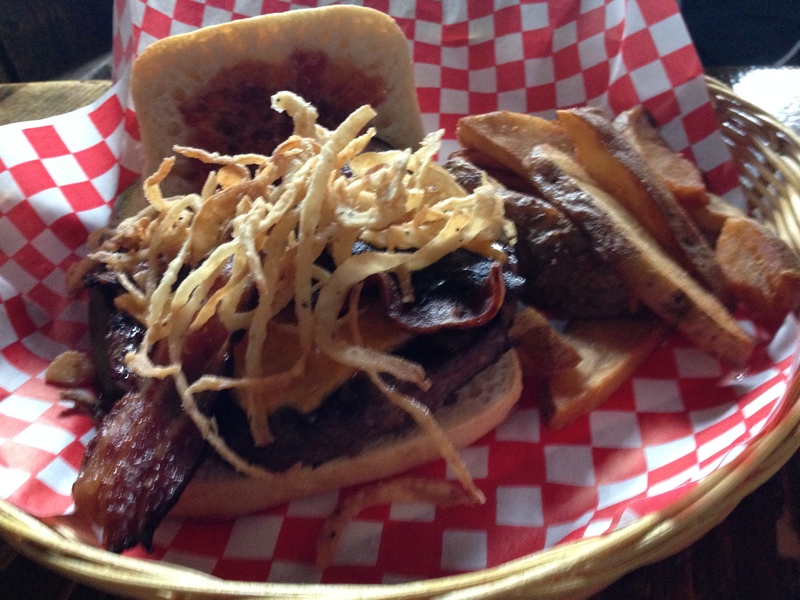 The cheeseburger came with fried onions, bacon, mayo and barbecue sauce on top. It was a very large burger, and the ingredients were quality. My fish fry was excellent and a huge serving. The beer batter on the two pieces of whitefish was the perfect consistency and had a great flavor that wasn’t overpowered by the beer. 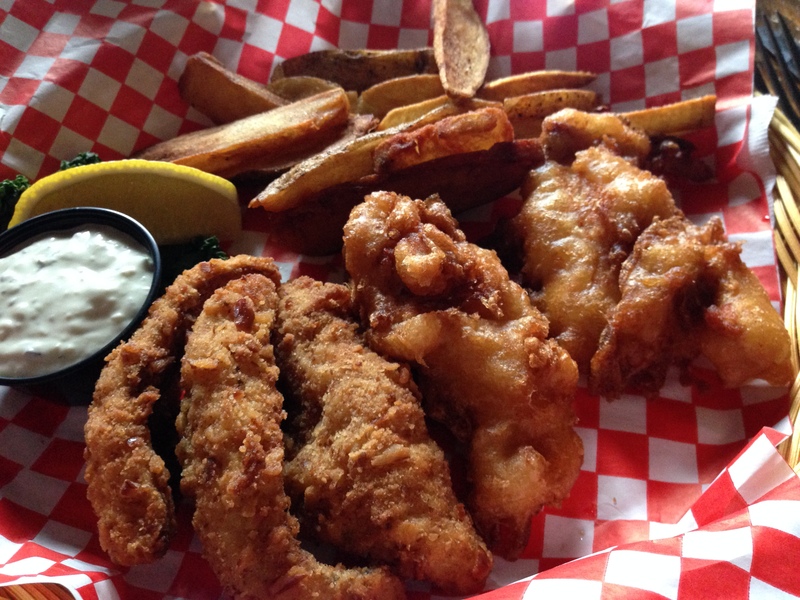 The three pretzel-crusted pieces of perch tasted like super sophisticated versions of fish sticks. I loved them! The basket also came with french fries that were made even better by the cheddar sauce from my appetizer! There were three options for dessert: turtle pie, caramel apple steamed pudding and a hot fudge brownie sundae. The hot fudge brownie sundae was simple but good. 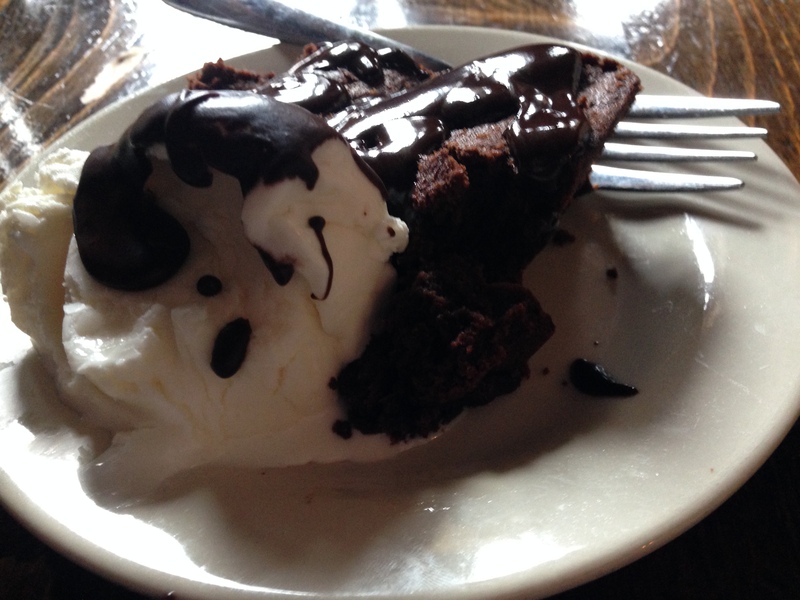 The brownie was chocolatey and chewy, and the ice cream was great with the hot fudge. It was definitely the perfect ending to a good Wisconsin meal. The turtle pie was huge. 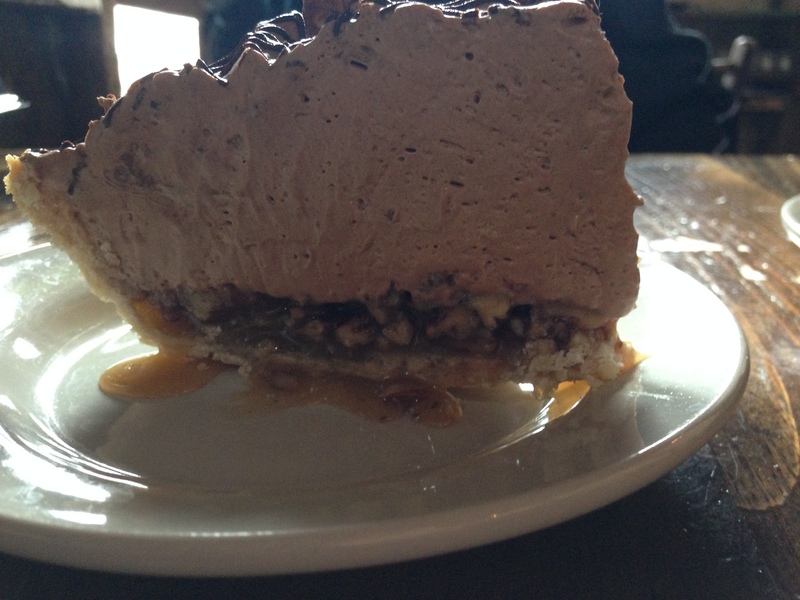 It was basically a caramel pecan pie with a lot of bavarian chocolate cream on top. It was good but very sweet. FOOD NOTES: I have zero complaints about my Restaurant Week meal at Quivey’s Grove Stable Grill. The appetizers were clever and extremely tasty. The entrees had quality and quantity going for them, and I absolutely loved the pretzel crusted fish! The desserts were unapologetically simple, just the way I like desserts!I definitely hope to go back again for their regular menu! I love Madison Magazine’s Restaurant Week. I take advantage of reasonably priced menus at great Madison restaurants during both the summer and winter events every year. This year during the winter week I was lucky enough to enjoy four restaurant week menus. Restaurant week starts on a Sunday, so I always take full advantage of my Sunday nights off and invite my mom. 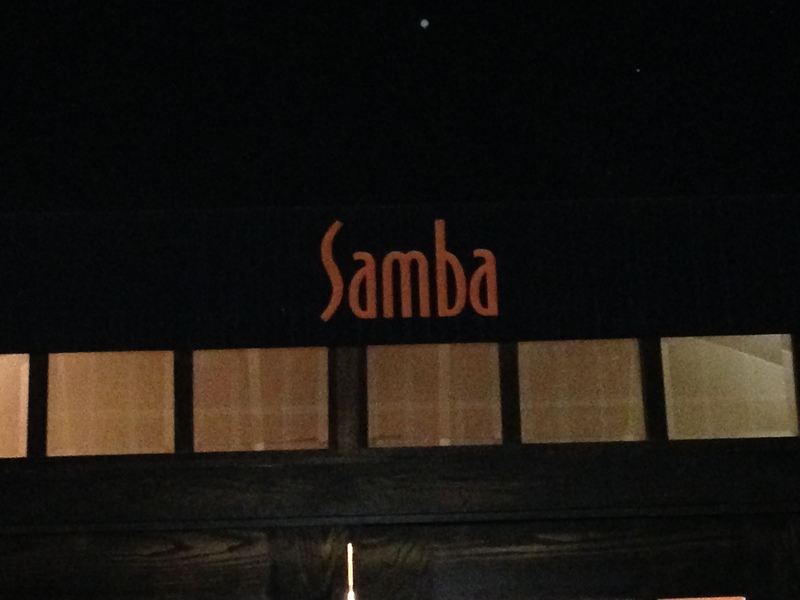 This year we went to Samba for our Sunday-night dinner! Samba has been on my list for quite awhile, but because of the high prices (it normally costs $50+ per person to eat at Samba) I never put it at the top of the list. With almost 50% off during Restaurant Week it seemed like a good time to go! 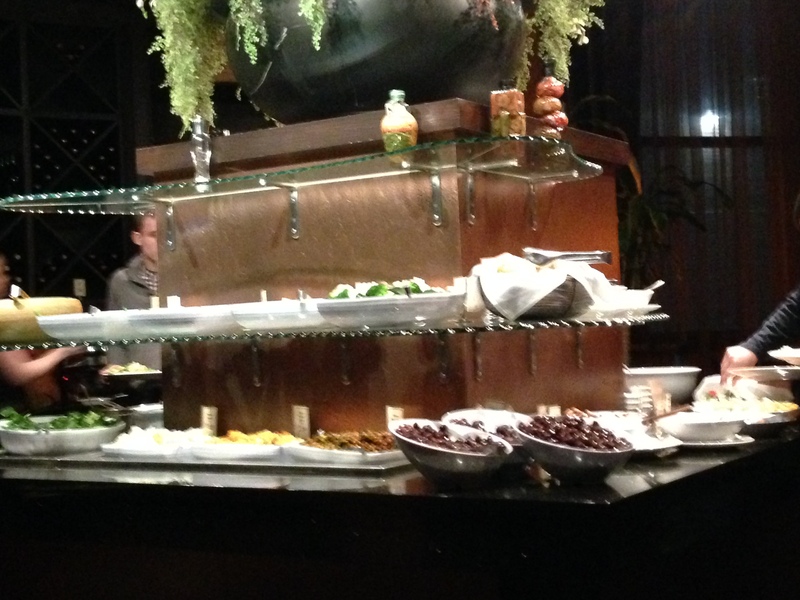 I had heard two things about Samba before going: the salad bar is amazing, and the servers (gauchos) bring skewers of meat around to the tables. Both of those things are true. The large four-sided, three-tiered salad bar features traditional salad fixings, prepared salads, cheeses, nuts, pickled items and other great sides. I’m a huge fan of salads and love it when I can put a ton of interesting stuff on top! I mainly avoided the prepared salads in an effort to save room for the meat delivered by the gauchos. But I loaded up my plate with fresh lettuce, vegetables, pickled beets, croutons, candied nuts, cheese, olives and a great caesar dressing on both of my trips to the salad bar. Samba also offers a couple of hot options near the salad bar. The night I was there they had soup, mashed potatoes, rice and some beef roast. I didn’t go for these options, again, in an effort to save room for the skewered meat. The meat pillar is a very powerful tool at Samba. 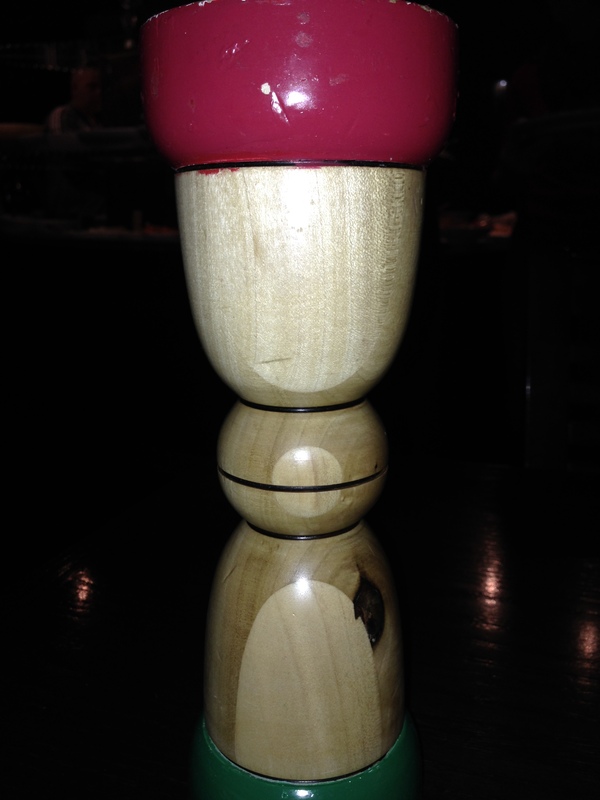 It is a small wood pillar with green paint on one side and red paint on the other. It’s simple. When the green side is up, the gauchos will stop at your table. When the red side is up, the gauchos will not stop at your table. Mom and I decided to try everything once, but we only asked for seconds of certain skewers. The pork, chicken, lamb and sausage skewers were all fine, but not great (warning: we are not lamb people!). Because it was restaurant week, the usual eight skewers circulating the dining room was dropped down to six, they cut out two of the beef options. Usually they offer top sirloin, beef tenderloin, seasoned flank steak and beef strip loin. For Restaurant Week we got to sample the flank steak and tenderloin. The tenderloin sprinkled with sea salt was fine, but the seasoned flank steak was spectacular. It was encrusted with a great flavor and was perfectly juicy. Needless to say, we got the flank steak a couple of times and even made friends with that gaucho! At the end, it became a game to get only the gauchos with the food we wanted to stop by flipping our pillar over to green when they were close! The hardest gaucho to flag down that night was the guy serving up the grilled pineapple. Our server was helpful in tracking down the pineapple gaucho, but he was so much in demand that both times he stopped we asked for two servings! The pineapple is super simple, but super good! It is grilled with cinnamon and sugar, and comes out juicy and warm and super tasty! 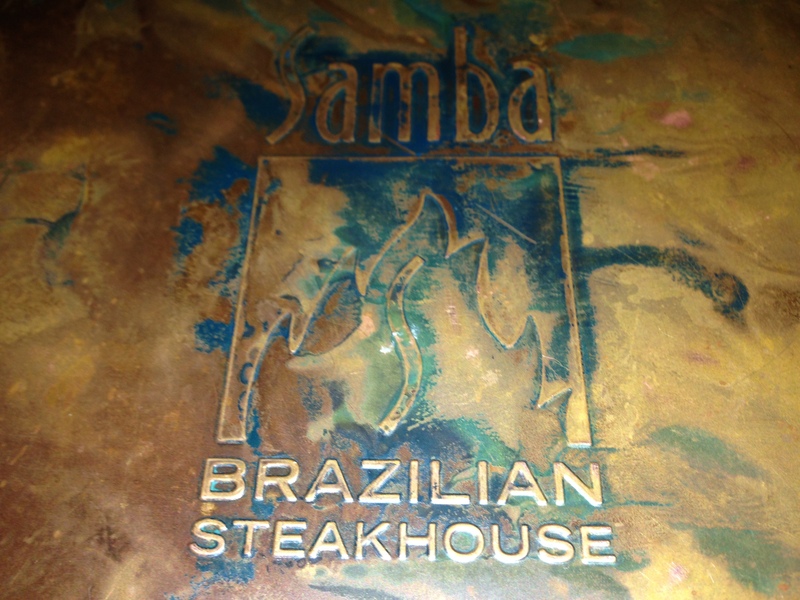 FOOD NOTES: Samba is definitely an experience. It is a huge ballroom-type dining room with a second level and low lighting. Scoping out gauchos with the stuff you want is exciting and makes the dinner fun. The salad bar is huge and impressive, but my advice it to stay away from unnecessary fillers like bread, generic pre-made salads and salad-bar hot food. I suggest saving room for the main attraction, especially if you’re paying full price. The mango chicken and parmesan encrusted pork were forgettable. The flank steak was exceptional. The grilled pineapple was simple but stellar. If I could go to Samba and get just the salad bar and grilled pineapple it would become one of my regular stops. But since that’s not an option, and the price is quite a bit higher than my normal dinner out, I probably won’t be back for a while. 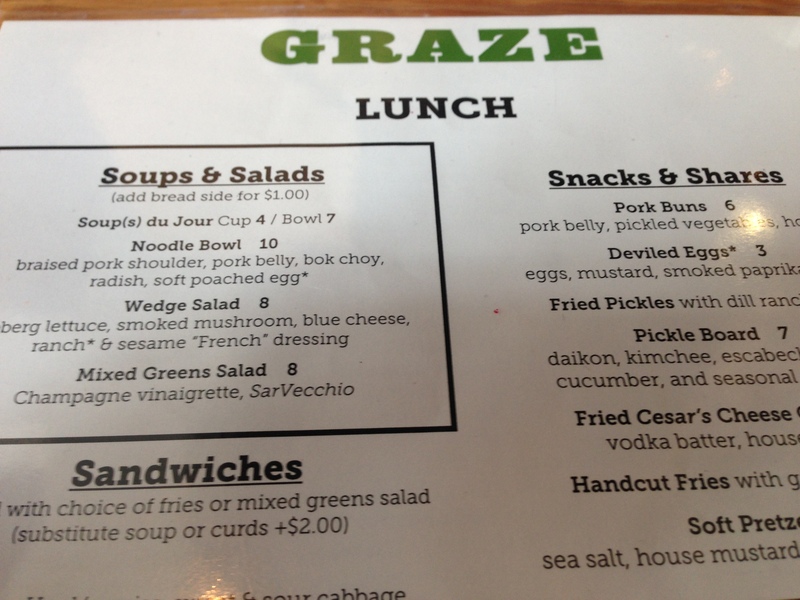 A couple months ago I finally made it a priority to visit Graze on the Square for dinner, and I loved it. So recently when a friend and I were downtown looking for a good lunch I suggested the landmark Madison restaurant. The atmosphere and view is only slightly less impressive in the daylight, but that is overshadowed by the fact that there were actually open tables! Michelle is sort of new to the area and hadn’t been to Graze yet so we had to get the fried pickles. Nothing has changed since my first tasting, and once again the thoroughly enjoyed them! For my entree I wanted to try something new, so I got the Noodle Bowl. 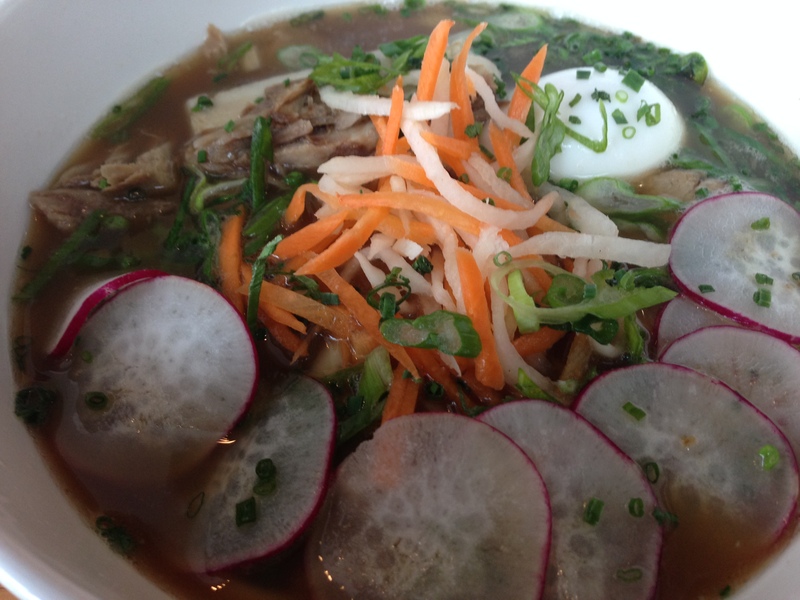 It was a huge bowl filled with a perfectly salty broth, braised pork shoulder, pork belly, bok choy, radish, noodles and a soft poached egg. I am 100 percent glad I tried it, but will probably never get it again. I enjoyed the flavors and the different components of the bowl, but it just wasn’t something I loved. The serving was way too big for lunch (I took over half of it home), and some of the pork pieces could have been a little crispier for my taste. 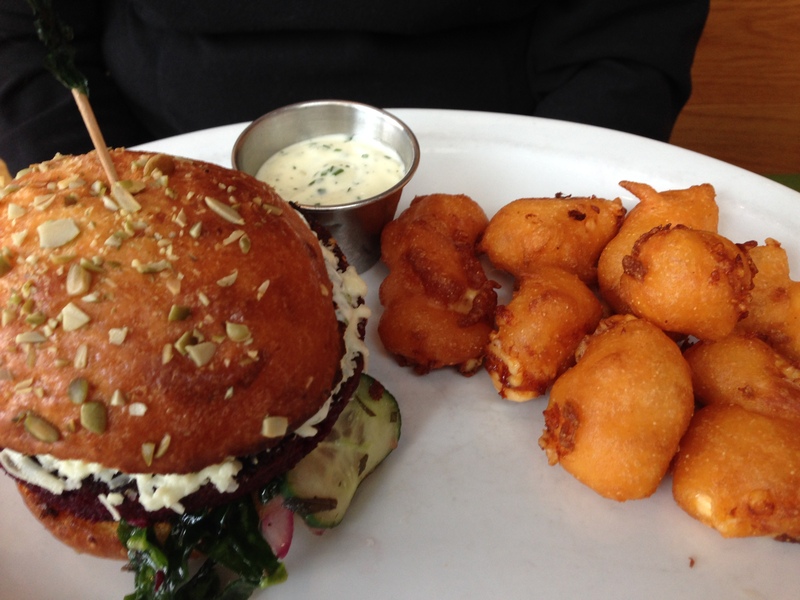 Michelle got the beet and walnut burger with cheese curds instead of fries…I vote good choice on getting the cheese curds!! FOOD NOTES: I will always love Graze and the amazing view of my city they offer. I definitely recommend partaking in the view at night, but it is pretty awesome during the day too. The fried pickles and cheese curds are just as awesome during lunch. I’m very glad I got the noodle bowl and enjoyed the different ingredients, but it was a bit heavy for lunch. I really wish they offered the beet salad on their dinner menu for lunch…I loved that salad, and it would be perfect for lunch! I am always interested in trying new flavors and new types of cuisine, so when the opportunity presented itself to try Persian food I jumped on it. I prefer authentic Mexican food to Tex-Mex, I love Indian food and Mediterranean food and Laotian food and Japanese food. I’m pretty sure I would love Thai food if I could eat coconut and can’t wait to try traditional Korean food. 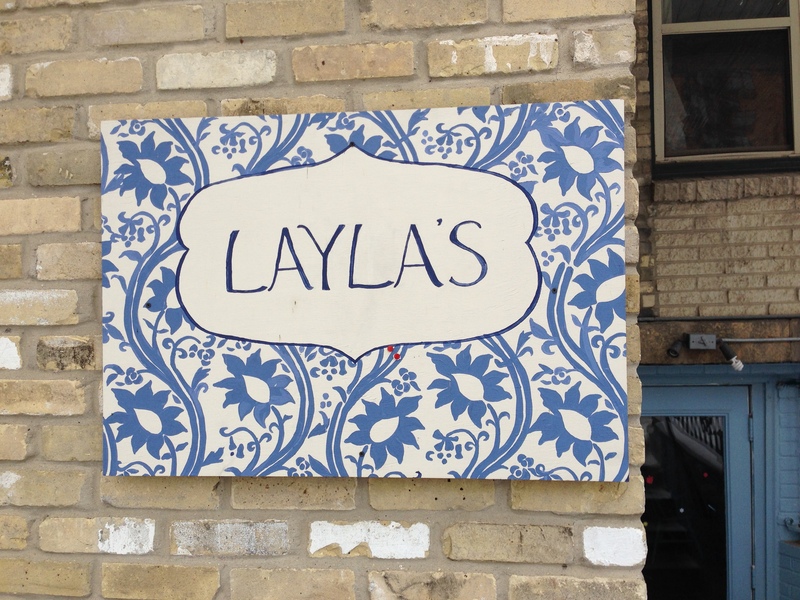 There are a ton of options in Madison for ethnic food, but only one Persian food option – Layla’s. Layla’s has taken over the old basement location of Cafe Costa Rice off the Square, but has spruced it up and given it a colorful flare. There are only four tables and one employee – Laila (yep, she’s the namesake but she changed the spelling to make sure it was pronounced correctly). Laila makes traditional Persian food, which hails from Iran. Layla’s menu offers two standing dishes and two rotating seasonal options. 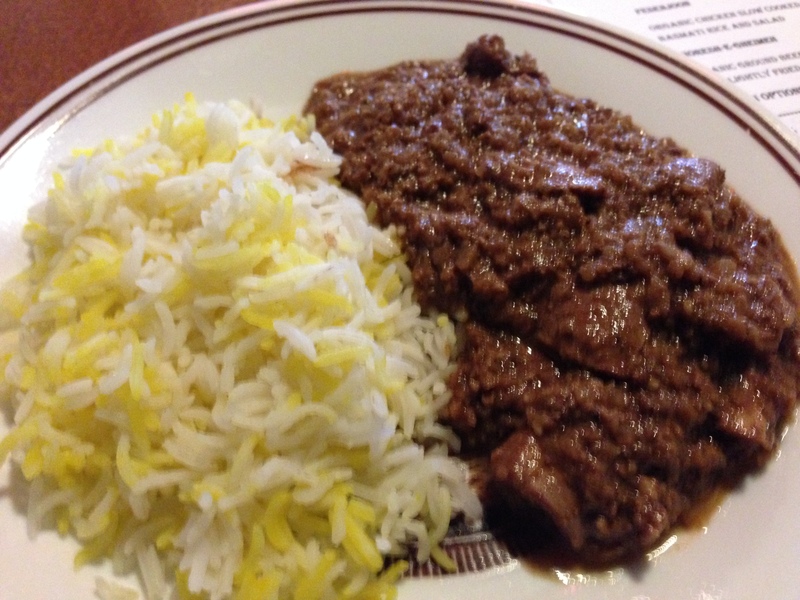 When I went we got to try the two standing dishes – Fesenjoon and Ghormeh Sabzi, both are served with rice. The Fesenjoon is made with organic chicken cooked in a walnut pomegranate sauce. The chicken was beautifully cooked, but the sweet walnut pomegranate sauce was a little odd. I’ve never been a fan of sweet flavors mixed with savory dishes. On top of the odd flavor the pureed walnut added an equally odd consistency to the sauce. I really wasn’t a fan. 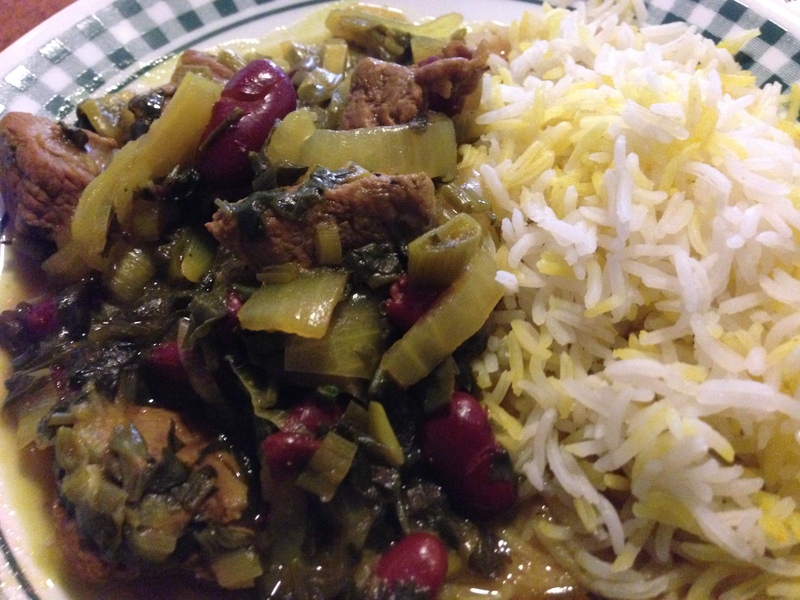 The Ghormeh sabzi is made with grass-fed beef, kidney beans and Persian limone slaw. I liked this one more than the Fesenjoon, but it was not impressive. The beef was cooked very well, but the sauce was mostly flavorless. I had high hopes for something with lemon flavor in it, but the sauce was almost nonexistent. FOOD NOTES: Laila did a good job sprucing up the basement space, but her food was not my cup of tea. I love that she uses organic and grass-fed meat. The first dish was too sweet for my taste, and the second one didn’t have enough flavor. I left thoroughly unimpressed and will not be returning. I put a lot of stock in restaurant reviews on Yelp. I feel that the masses will reflect the actual quality of a restaurant. Usually I read the first five reviews and then a couple of the really bad ones to have a good expectation of what I’m walking in to. The first time Yelp reviews have really led me in the wrong direction was for Sophia’s on Johnson Street. The reviews said Sophia’s has the best breakfast in town, and I couldn’t disagree more. The first strike against Sophia’s happened when I picked a friend up for breakfast on a Friday and Sophia’s was closed. Apparently, Sophia’s is only open on Saturdays and Sundays. That does not seem like a good business plan to me. A month later that same friend and I drove back over to Sophia’s on a Saturday for breakfast. Sophia’s is in a small building on Johnson Street that is so nondescript I have driven by it dozens of times and have never noticed it. When you walk in the first thing you will notice is that there are only five tables and a small counter by the front window. I’m not against small restaurants but this takes “small” to an extreme. To get to the only open table in the place (which I didn’t think there was going to be one for us when we first walked in) we had to awkwardly climb over two people sitting at the table in front of the empty table. You order at a counter and they bring your food out to you. But the weird part about Sophia’s is that once you’ve waited in line to order, then you have to wait in line again when you’re done eating to pay, because you pay after you’re done eating. Usually if you order at a counter you do the whole ordering and paying thing in one transaction. Having to wait in line once we were done eating just to pay was super inconvenient. I could be persuaded to forgive the cramped space and the odd payment system if the food had been great. But unfortunately it was not. 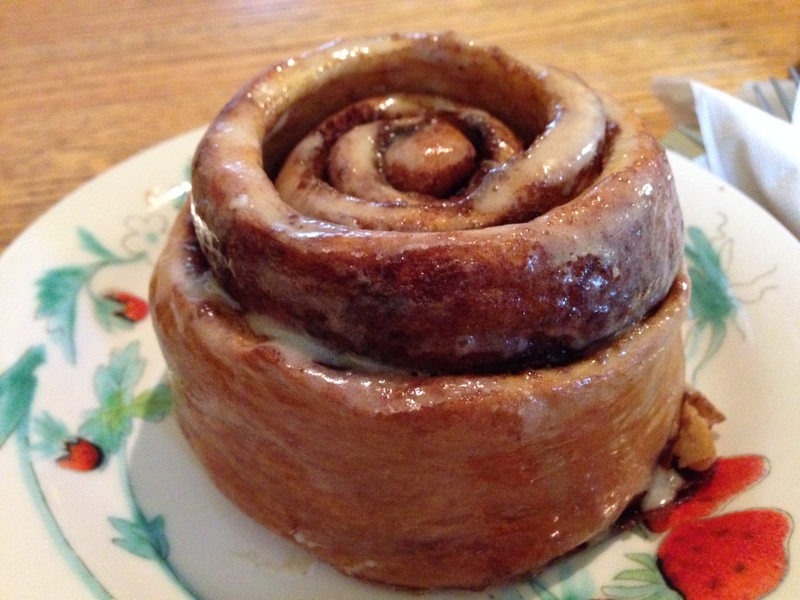 The cinnamon roll we got was more like a cinnamony morning bun with an odd lemon glaze on top. I’m sorry but when I want a cinnamon roll I want it to be frosted or glazed with vanilla or cream cheese goodness…not an oddly tart lemon concoction. Their menu, not posted online anywhere, is written on a chalkboard, which I’m assuming means it changes. When we were there they were offering a couple different omelets and breakfast sandwiches, as well as pancakes. I’m a savory breakfast person so I got an omelet. It had cheese, ham and peppers in it. The peppers were tasteless and seemed like they may have come out of a can. The omelet itself was kind of watery and the cheese was sparse. I was thoroughly unimpressed, especially because the guy sitting behind me at a different table kept rocking his chair into mine the entire time. 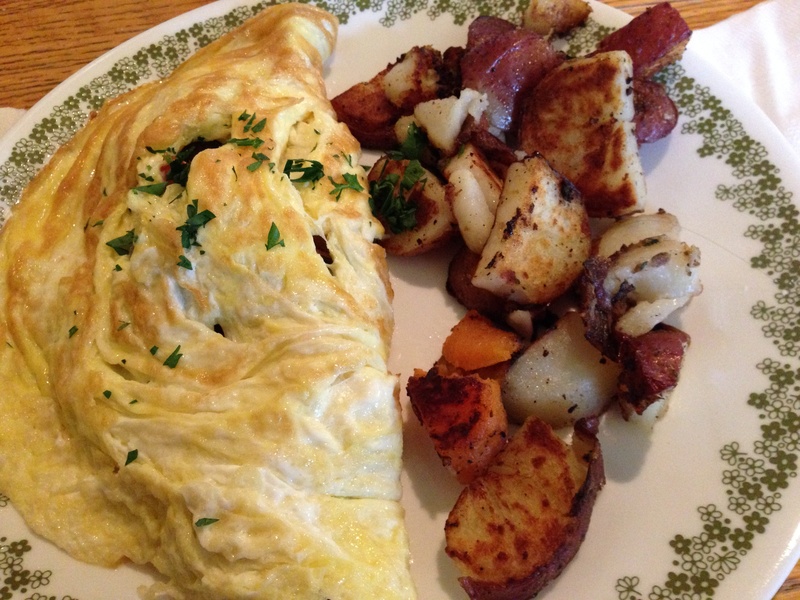 The omelet also came with breakfast potatoes that weren’t crunchy enough for my taste and were very bland. 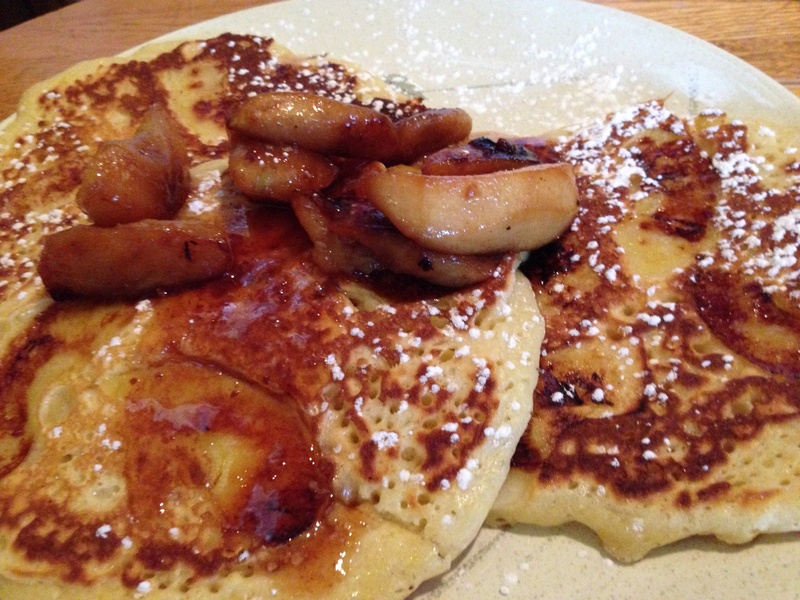 My friend got apple pancakes, which were the special that day (but she said the last time she was there the special was the same so my guess is it doesn’t change very often). FOOD NOTES: My favorite restaurant in my hometown only has about a dozen tables, and I’m able to overlook the small space because the food is so good. The one thing that place does well is that even though they have 12 tables, there’s a reasonable amount of space between them so you don’t have to climb over people to get to a table. The food at Sophia’s is nowhere near good enough to make up for their annoying dining area. The lemon flavor on their cinnamon roll was not appreciated, and their omelets and breakfast potatoes were subpar. Their prices were also a bit high for the extremely cramped and rundown dining area we had to endure. 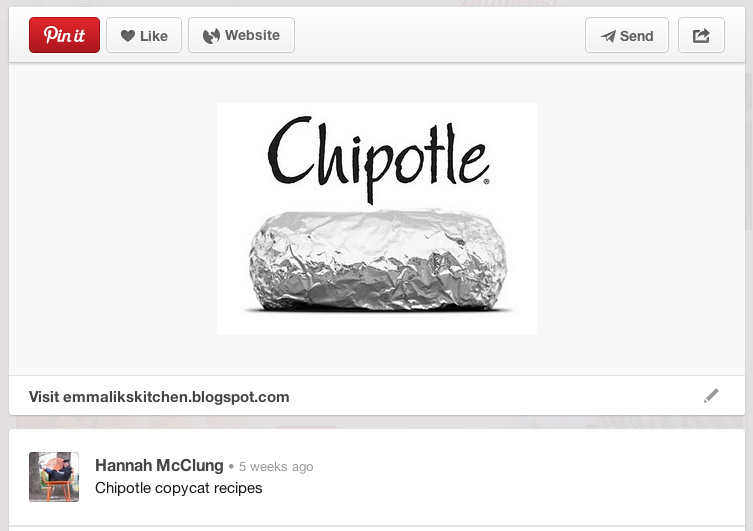 Pinterest helped me make Chipotle at home! Chipotle is by far my favorite fast-food/to-go restaurant, but it is kind of pricey and pretty high in sodium. So I decided to try and recreate my favorite Chipotle burrito at home to hopefully make it healthier and taste close to the real thing. My first stop in this plan was Pinterest. I found a pretty great webpage that had copycat recipes for all of the components I wanted. The chicken copycat recipe looked too complicated for me so I just cooked mine on my George Foreman grill. I also bought my guacamole in 100 calorie packs and used canned (no salt added) black beans. I don’t like cilantro and rice has always seemed like an unnecessary filler, so I skipped the cilantro lime rice. I did use the recipe for corn salsa and it was very good! Corn salsa is my favorite and it is surprisingly super simple to make. FOODNOTES: All in all, my homemade Chipotle burrito bowls were nothing like the actual Chipotle bowls, but they were very good! 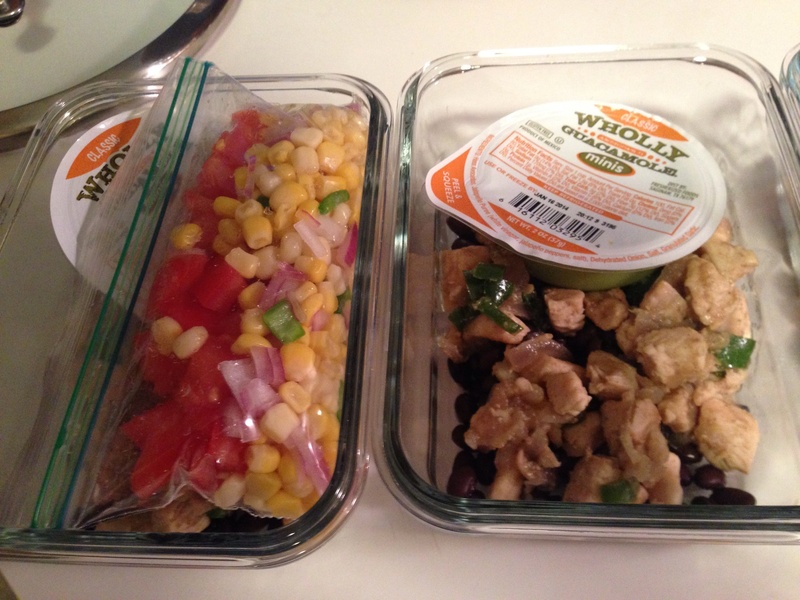 They were also only 430 calories compared to the real Chipotle bowls, which hover around or over 600 calories. I definitely plan to make this a regular addition to my recipe rotation! I have been cautiously trying different Chinese food restaurants in Madison for a while now in search of the best place to go for my Chinese food fix. There are some places I will never go back to and some places that I wouldn’t mind making my go-to place. But I continue to solicit suggestions from friends in search of that perfect place. Thanks to Adam Schrager, I was directed to Orient House on Park Street. He said it is a family favorite and I can see why. A friend and I decided to order Chinese food during the Capitol One Bowl to root on our beloved Badgers, so I suggested Orient House. Their menu is pretty common with a good lunch deal where you get an entree, rice, 2 crab rangoons and you can get an egg roll for $1 extra. My go-to entree is chicken lo mein. Our order took almost an hour to be delivered but I’m sure New Year’s Day is a busier day than normal. My lunch special was definitely enough for two meals with a large portion of the lo mein and a good amount of fried rice all for under $10 including delivery tip! The fried rice was pretty standard, the egg roll was a little greasy but was very good, and the crab rangoons were crispy with very creamy filling (I’ve had dry crab rangoon filling…not sure how it happens but it’s gross!). Most lo mein tastes the same so I look for things that are bad: not enough chicken, undercooked veggies, greasiness. 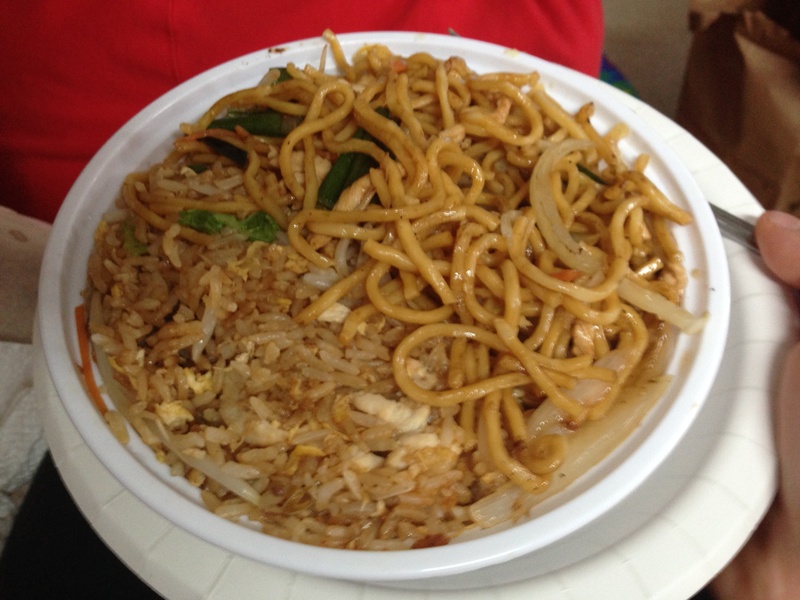 The lo mein from Orient House definitely passed my test! It had a good amount of chicken, perfectly cooked veggies and wasn’t too greasy. I thoroughly enjoyed my lunch special lo mein the first day and on the leftover day! FOODNOTES: They deliver but only to the downtown and near west side so if I want Orient House I’ll have to drive downtown. Because of that it probably won’t be my normal place, but I wish it could be! The prices (especially lunch prices) are very reasonable. Their menu and portions sizes are pretty standard. I very much enjoyed my lo mein. It had good flavor without extra greasiness. Adam’s recommendation is a win in my mind!